This article shows how to upload and download files in ASP.NET Core 2.2 MVC and save the files to a MS SQL Server using FileTable. The data access for the application is implemented in a separate project and EF Core migrations is used to setup the select logic for the database. A new database is created in MS SQL Server which has Filestreams enabled. This feature only works with windows authentication. Firstly if not already configured, the Filestream access level is set to 2. Now you can check if your database settings are ok. The files can also be accessed using plain SQL. A file description table is created for searching and returning multiple records. This is used to setup a download link and provide a small description of the file. To create the table, Entity Framework code first is used in this example. Add Entity framework Core to the csproj file in your project. The EF Core dependencies need to be added and also the ef commands. An entity context class has to be created to use the database. This is used for the migrations and also the data access. The class used as the entity also needs to be created. The primary key for this class is also defined in the context class. The connection string needs to be added to the config file which is used in the context. This is required for migrations and also running the application. The migrations can be created and the database can be updated. Open the application using the command line in the src folder where the project is defined. The migrations are executed from the project containing the Startup file where the DbContext is used. The migrations needs to be set to this project then in the AddDbContext method. 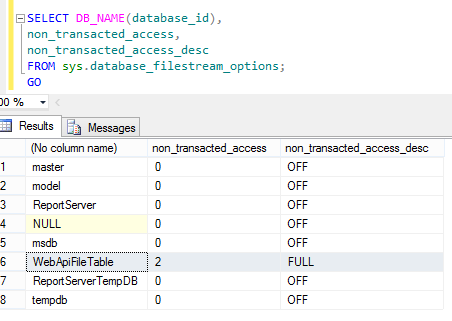 If you don’t want to use EF7 migrations, you could just create the SQL table using plain TSQL. The ASP.NET Core MVC application is a simple project with razor views and a FileUpload ASP.NET Core MVC controller to upload and download the files. The data access project is added as a reference in the csproj file in the dependencies. It does not matter if the dependencies uses sources from NuGet or from local projects. ASP.NET 5 provides the IFormFile class for file upload. This class is used inside the FileDescriptionShort, which is used for single or multiple file uploads. The FileUploadController has two action methods. The controller uses the default DI with constructor injection to add the dependencies. The UploadFiles action method uses the FileDescriptionShort class as a parameter. The method takes all the files and saves each file directly to the MS SQL Server FileTable. Then the file descriptions are saved to the database. The descriptions are used to list and download to files. The IFormFile SaveAsAsync extension needs to be added. /// Asynchronously saves the contents of an uploaded file. The upload method also uses a service filter to validate the mime type. The ValidateMimeMultipartContentFilter class implements the ActionFilterAttribute which provides virtual methods which can be overridden. This attribute throws an exception, if the mime type is incorrect. A file upload requires a multipart content type. All the required application configurations are implemented in the Startup class. Entity Framework, configuration, attribute, and class dependencies are defined here. The application displays all the existing files which where uploaded when started. Does the FileDescriptions table exist in your Database? Good comments ! I was fascinated by the info – Does someone know if I would be able to find a template Form A version to fill in ? Anyway, you don’t shot the FileResult class in the post, so I was turning crazy looking for, until I donwload the entire project. I get confused at Step 2. Q: Am I on the wrong track? It is very confusing at the moment because everything is being switched back to msbuild and VS2017 is only in RC and still not bug free or missing features from the project.json. Thanks Damien, for the quick reply! I found those tools already listed in my project.json file, among others. That got the thing to build, at least. I created the database tables directly because I couldn’t get migration to work. But when I debug, the project doesn’t start. seems like something is not installed on your PC, check that the VS version is correct and that the command line is working. I ran dotnet restore successfully. But dotnet run failed because I have framework versions 1.0.0 and 1.0.1 installed, but not 1.1.0. I thought EF 1.1.0 would require VS 2017. Should I (somehow) install EF 1.1? Should I get a later version? I saw the LTS ‘Button’, but it was just an AJAX message when I hover over it, it wasn’t a real button. Clicking it did nothing. It only showed a description of that LTS means. It looks like I can download .NET Core 1.0.3 SDK – Installer from that page, but not EF 1.1.0. Earlier, I did install EF 1.1.0 from the NuGet package manager, but like you said before, that didn’t work. Do you have a URL for a download page for EF 1.1.0? Do I need VS 2017? sorry, you need to click the current button. In debug, I was able to step through the code and then see a web page render in the browser! Thanks again for your work on this and for your patience with me!!! It’s hitting my database and doing everything I would hope it would do! Now I just gotta learn how you did this. The app inserts to the FileDescriptions table and the page renders with a link to the file, but clicking on it breaks. The file has not actually been saved to the WebApiUploads table. I am able to insert/retrieve files to/from the WebApiUploads table via T-SQL and via the File Explorer, as you explained. But the app isn’t touching that table. I’m looking at \IISExpress\TraceLogFiles\AspNet5FileUploadFileTable for clues. I seem to have found my problem. It’s trying to combine the path to my database table with the full path to the uploaded file, including “C:\…etc.” where clearly we want only the file name and extension. .. still looking into the details. When i try to import project VS15 , program gives error. maybe i need to upgrade my VS15 to VS17, right? Thanks for the great example. I’m wondering if anyone has ideas on how to handle delete. It would be nice if the FileDescription was deleted when the file was deleted and vice versa. One idea is using a foreign key in FileDescription to path_locator column in the file table and cascading delete. However I’m not sure how to set this up in EF Core. It appears that sql column type HierarchyID is not supported in core. I’m struggling to see where the FileTable dbo.WebApiUploads is actually being referenced? The fileshare created is used in your config.json but other than that the FileTable isn’t actually being accessed and the information is stored in a separate table, so this would still work without FileStream/FileTable? I’m with Mark (1/9), where does this use the benefits of FileStream/FileTable? The example uses the folder created by the FileTable. To upload, download, the files are saved directly to the SQL FileTable. If you wanted, you can access the files through the FileTable with SQL. What benefits of upload/download persistence are missing? For me it’s that the actual FileTable you see and query in the database isn’t actually used and you have the FileDescriptions table instead. If you were to allow non-transactional access to the FileTable then the FileDescriptions table would be incorrect the files were modified. Perhaps you could put a trigger on the FileTable to ensure the FileDescriptions table is in sync. Hi Mark thanks for your feedback. Can we continue this discussion here? My main reason for doing this was performance. At first I used the FileTable through SQL queries but had problems. Would be very grateful for improvements, feedback. Unable to create an object of type ‘FileContext’. Add an implementation of ‘IDesignTimeDbContextFactory’ to the project, or see https://go.microsoft.com/fwlink/?linkid=851728 for additional patterns supported at design time. —> System.MissingMethodException: No parameterless constructor defined for this object. What should I do to make your project runnable? Thank you for pointing me to FileTable, saved me lots of headaches :D. Just to add my 2 cents, I am using Path_locator property instead of the name to avoid duplicities since it’s not unique in the FileTable. By using GetPathLocator() SQL Server function you could update this property passing the full file path where it was stored.